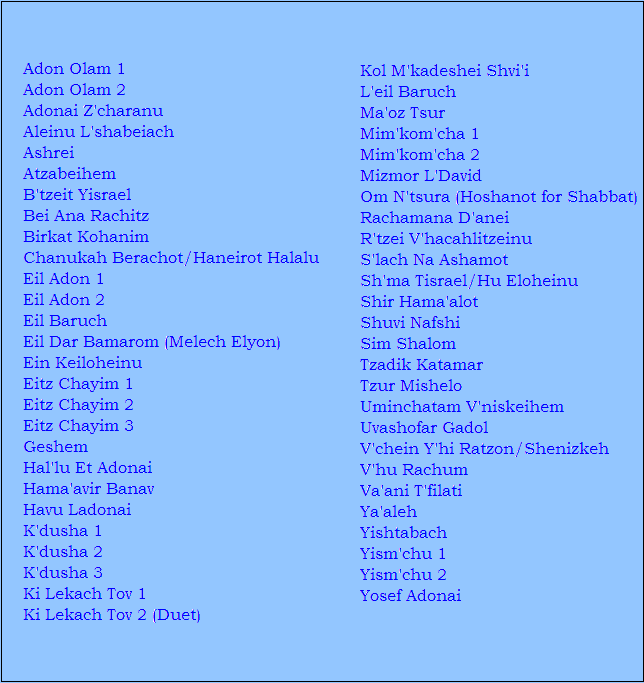 Shiru Lo Shir Chadash is my first collection of compositions for use in Synagogues. I have been writing Shul music for more than forty years, and during my career as a Chazan I used most of them. It never occurred to me that anyone would want to publish them. I was therefore very happy to the proposition made by Cantor Arie Subar and Stephen Glass (both of Montreal) that they be made available to a wider audience, and so they set about the arduous task of editing them and putting them into a the very fine volume that it has become. I am currently working on my second volume, and I hope it will be available in the near future. A unique feature of this book is that every piece in it has been recorded by the distinguished Chazan, Cantor Gideon Yechiel Zelermeyer. He is accompanied by the beautiful arrangements of Stephen Glass, whose innovative harmonization is include throughout the book in the form of chord symbols. This will facilitate the learning of the pieces, even by people who are unable to read the music. In 2005, I was a presenter at the European Cantors’ Convention, held in London, England, under the auspices of the Jewish Music Institute. One of the sessions was given by Geoffrey Shisler and focused on a number of congregational melodies which he had written and used throughout his career, with considerable success. I was immediately struck by the attractiveness of the tunes and felt that they deserved a wider audience. ……. I truly believe that these pieces have a role to play in synagogue services today. In many cases, they are simple to learn and very appealing. I hope that my colleagues will be open to incorporating these new tunes into their repertoire…. Having grown up in the UK, where I often heard Geoffrey Shisler lead services, accompanied him in concert and for weddings and studied with him, it is especially meaningful to have been involved in the production of this book. I would suggest that the wider incorporation of some of these melodies into the regular synagogue service is one of a number of initiatives that can help in the important process of musical renewal and freshness in traditional Jewish prayer. One often hears people bemoan the fact that the music of the synagogue today it once was. And that’s not surprising-it shouldn’t be, and can’t be! ………one of the challenges for those leading services today is how to engage the modern-day congregation. One of the ways is through the melodies. People can be deeply moved by listening to beautiful music, even when it is sung by someone with an average voice or musical ability, and when singing together, people who do not have trained voices at all can be inspired by the tunes that they sing. While the melodies in this volume are not all intended to be sung by the congregation, I hope that people hearing them will find them appealing, and that the songs will enhance the listeners’ feelings of devotion. I trust that you will find something in this collection that you can add to your repertoire.